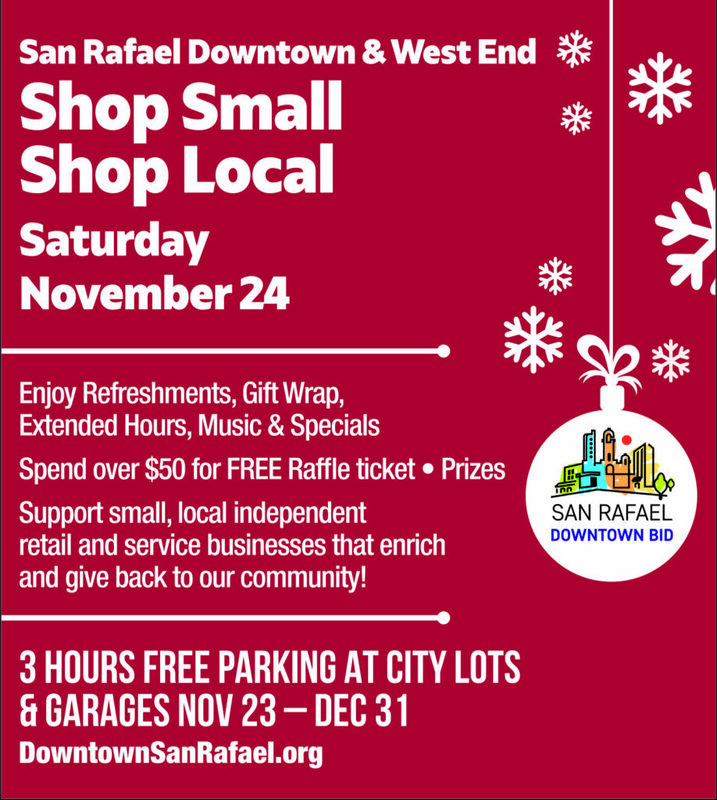 On Saturday, November 24, 2018 and throughout the Holiday season, you can support Downtown San Rafael’s small businesses and entrepreneurs by participating in “Shop Small / Shop Local Saturday” and encourage local friends and residents to ‘shop small” in both Downtown and the West End Village. Shop Small / Shop Local Saturday plays a key role in driving customer traffic and growing revenue for our locally owned independent businesses during the important holiday retail season. We’re also encouraging consumers to ‘dine small’ by grabbing a bite or a drink at a local eatery or brew pub. By shopping local and small, and using local services, the majority of the money stays within our community. Small business owners and local San Rafael businesses are the fabric of our daily lives. They have energy and passion for what they do, and when we support small businesses, jobs are created and local communities preserve their unique culture. Shop Small / Shop Local Saturday provides us an opportunity to honor and celebrate the hardworking folks that are creating jobs and fueling the economy in San Rafael. These are the businesses that sponsor our local sports teams and local events so let’s give back to them!